Twin size mattresses are often used in guest rooms. These are excellent for average sized-adults, and even children. They can provide a comfortable sleep to users, while not taking up unnecessary space in length or width. The size of a typical twin mattress is 39 inches in width and 75 inches in length. A twin mattress may be too short for most men, but it remains a popular choice in college dormitories and houses where spaces are limited. There are different types of twin size mattresses available in the market. One is a memory foam mattress made mostly of polyurethane. It’s ideal for people who suffer from joint and back pain because it softens when someone lies on it. Another variation is latex foam, which is hypoallergenic. Then there are mattresses made of innerspring. These are traditional mattresses that are made of steel coils in different configurations. It’s the most inexpensive type of mattress and obviously, the most widely sold. Another type is the adjustable air mattress, wherein an electronic pump is attached to the bed. This type usually has additional layers on top like a foam. It can be inflated to different firmness levels, depending on the preference of the sleeper. However, the noise of the pump can be annoying at night. In buying a twin mattress, make sure that you or the person that will use it will be comfortable enough with the size of the mattress. Other considerations in buying include the firmness of the mattress and the warranty provided by the manufacturer. Perfect Cloud UltraPlush Gel-Max 10 Inch Memory Foam Mattress – This memory foam mattress is ideal for people who sleep hot, as it has a two-inch layer made of Gel-Max memory foam providing additional body comfort and helping in the regulation of the overall sleep temperature. Gel-Max memory foam ensures its users a comfortable rest night after night. The upper layer is a thick, 1.5 inch air infused memory foam layer that provides a five-star comfort to its users. The third layer is 6.5 inches thick, with base support for a weightless sleep experience. This a low to mid-range option. Signature Sleep Contour 8 Inch Twin Mattress – This 8-inch deep Contour twin mattress from Signature Sleep is designed for sleepers who want a contoured support for their back. It has 480 tempered steel which are independently encased, all designed to conform to the curves of the sleeper’s body by creating an equal weight distribution This results to relief of pressure points along the neck, shoulders, hips, and back. This mattress can be slept on as soon as it has been unpacked. However, the mattress expands to its proper shape and size in 24-48 hours. This is a budget to mid-range option. 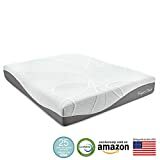 Arctic Dreams 10″ Cooling Gel Mattress – This cooling gel mattress is also great for people who sleep hot. It makes use of an advanced viscoelastic foam called Energex, which the manufacturer says is an alternative to conventional memory foam. The said viscoelastic foam is cool, highly open, and responsive. It also provides outstanding pressure relief to sleepers. It features three inches of the said gel foam. This is on top of the six inch convoluted high density polyurethane foam. The top layer is almost an inch of super soft, quilting layer. This excellent gel mattress from Dreamfold Bedding is a budget to mid-range option. 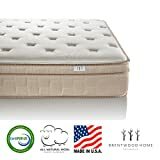 Brentwood Home Finale 10-Inch Eurotop 3-Zone Wrapped Spring Mattress – If you’re looking for a mattress that isn’t too firm or too soft, then this 10-inch deep mattress from Brentwood Home Finale is your bet. It provides a medium feel, with individually wrapped spring unit offering precise support to every area of the body by having three separate zones of support. There’s even a reinforced region for the lumbar area for preventing lower back pain. The top layer made of all natural wool provides a lot of comfort and reduces pressure points in the hips and shoulders. It also wicks away moisture, keeping sleepers cool in the summer and warm during the cold season. It also resists odours. 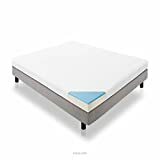 Lucid 5″ Gel Memory Foam Dual-Layered Mattress – This mattress has a memory foam that can provide a comfortable and restful sleep to its users. Underneath it is a four-inch supportive foam base that can give enough support to its users. The firm feel of this mattress conforms to the body, giving a lot of support to the body while relieving pressure. The mattress comes in a reusable duffle bag, which makes it convenient to move the mattress around just in case you’re bringing it somewhere else. This is a higher end mattress that has gotten rave reviews from people who have actually slept on it. As you can see, there are lots of good twin mattresses for adults that you can choose from. So how do you choose the right one for you? In case you are buying in a traditional retail store, lie down on the mattress that you are interested in. Spend at least five minutes on each side and on your back. This should give you an idea on how comfortable you are on the mattress that you are planning to buy. Of course, you don’t have this luxury when shopping online, so you should check return policies before placing any order. In the world of mattresses, return policies are called comfort guarantees. This ranges from a couple of weeks up to 4 months. Firmness labels are not precise. One brand’s firm model may not be the same as another brand’s option. This is why you’d want to test the mattress yourself. The return policies are different from the warranty, which can range from 10 to 25 years. This covers manufacturing defects like sagging, loose and broken coil wires. While there’s not much difference when it comes to mattress sizes, there’s a lot of variance in terms of price. So you should decide on a budget, and then start making a shortlist depending on your budget. You should not get carried away with marketing jargon like orthopaedic which really don’t mean much. If you’re suffering from persistent back pain, you should opt for a medium firm mattress instead of a firm one.